The Consortium for Sustainable Urbanization (CSU) representative, Ms. Ludivine Cornille, Director of Programs of CSU, has participated at the 26th session of the Governing Council of UN-Habitat in Nairobi in May 2017, on behalf of CSU. Following on the Habitat III Conference in Quito in October 2016, this session of the Governing Council has been marked by the ongoing discussions of what role would play UN-Habitat within the implementation process of the New Urban Agenda. Reflecting on the linkages between the New Urban Agenda and the urban dimension of the SDGs, including SDG11, the Member States reiterated the need for a better coordination within the UN agencies and recognized the role of UN-Habitat as focal point in the implementation process of the New Urban Agenda. The Governing Council also approved the Strategic Plan 2014-19 of UN-Habitat which includes the ideas and vision of Habitat III. The Independent Panel appointed by the Secretary-General of the UN to assess and enhance effectiveness of UN-Habitat after the adoption of the New Urban Agenda has gathered in Nairobi during the Council, to meet with the Governing Council of UN-Habitat, Member States, key partners in multilateral organizations, associations of local governments and other stakeholders. The report of the Independent Panel is expected to be submitted to the 71st President of the UN General Assembly in June 2017 and will feed in the High Level Political Forum in July 2017 and the 72nd session of the General Assembly in September 2017. Stakeholders present during the Council expressed their engagement with UN-Habitat and called for broader inclusion of civil society within the implementation process of the New Urban Agenda. 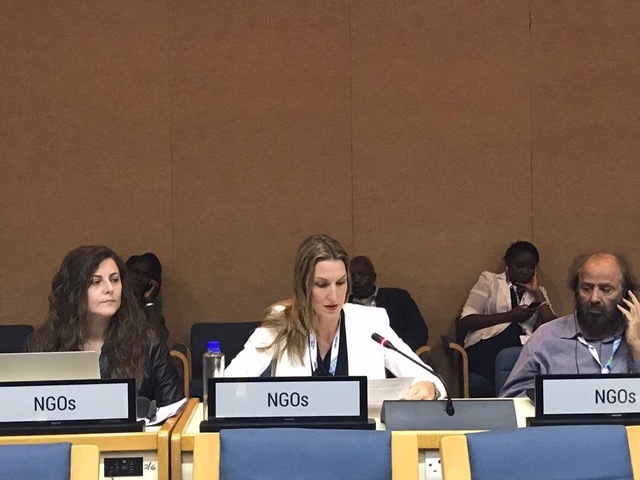 Ms. Ludivine Cornille, in her oral statement delivered during the High-Level Meeting on behalf of CSU, highlighted the efforts and vision of UN-Habitat to bring to light the critical role of sustainable urbanization within the United Nations system, and among Member States and civil society organizations. The 26th session of the Governing Council was also the opportunity to gather stakeholders involved in the Habitat III preparatory process together in Nairobi to exchange ideas on how to build greater synergies among government, cities and stakeholders to implement successfully and inclusively the New Urban Agenda. In this regard, the General Assembly of Partners, the independent platform umbrella of stakeholders’ engagement during the Habitat III process, held its Sixth Plenary Meeting on May 7 in Nairobi where it approved its revised Constitution and discussed the Partner Constituent Groups Strategic Frameworks and Action Plans towards the implementation of the New Urban Agenda. 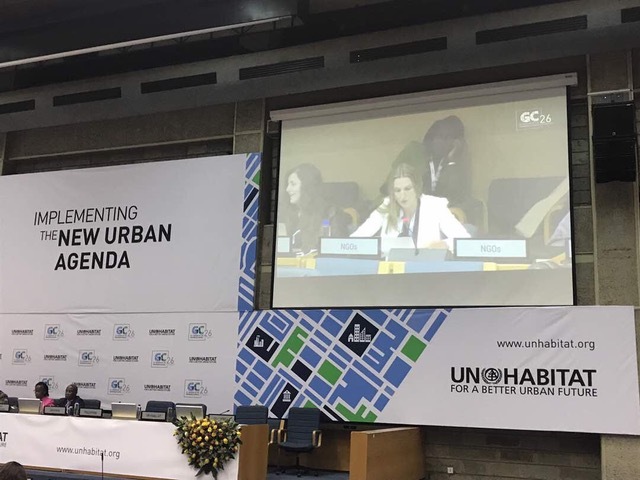 The General Assembly of Partners advocated during the Council for political leadership and stakeholder commitment to establish the General Assembly of Partners as a legacy of Habitat III, with the aim to engage wide participation of stakeholders in the implementation process of the New Urban Agenda. Considering the urban-relevant sectoral and cross-cutting areas in the SDGs, echoed in the New Urban Agenda, the implementation of the New Urban Agenda requires an innovative instrument to mobilize past and new multi-stakeholders and the private sector, along with national and local governments and the UN system. CSU is a member of the General Assembly of Partners, engaged in the Professionals Partner Constituent Group. 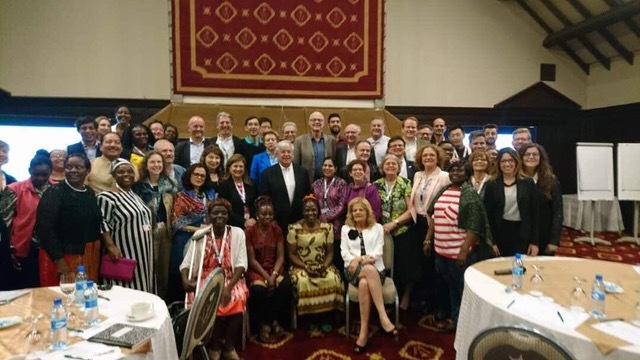 The World Urban Campaign (WUC), a stakeholder-platform of UN-Habitat, organized a workshop and Steering Committee 2 days prior to the Council, to mobilize WUC partners in providing inputs into The City We Need 2.0 Campaign and the Urban Thinkers Campuses. It also gave the occasion to WUC partners to share ideas in the role of the WUC Campaign and the WUC partners in the New Urban Agenda. CSU is an associate partner of the WUC. The World Urban Forum 9 that will take place in February 2018 in Kuala Lumpur, will be the first major urban conference following the Habitat III Conference in Quito and will be the occasion to establish groundwork on the engagement of stakeholders in the New Urban Agenda and how countries are currently monitoring their progress. Ms. Ludivine Cornille actively engaged in the Governing Council session, WUC workshop and Steering Committee as well as the General Assembly of Partners meetings during the Governing Council, seeking new collaborations to pursue CSU role of advocate of sustainable urbanization and resilient design within the New Urban Agenda framework. 77 UTCs will take pace in 2017 from March to November. The next call for 2018 will take place in the coming months. These UTCs will bring key recommendations to implement the New Urban Agenda. The idea of creating an Urban Thinker Academy has been discussed to bring together particularly academicians and universities for knowledge resources and best practices within the implementation process of the New Urban Agenda. Urban Synergies (Australia), Designing Hong Kong, City of Mannheim-Germany, UN Major Group for Children and Youth, IUA International (The Paris Region planning and development agency), ARCADIS, FIDIC (International Federation of Consulting Engineers), Citiscope, IHC Global (International Housing Coalition), World Vision International, Ageing Cities, S.E.R.R, Habitat for Humanity. The WUC meetings gave the occasion to raise knowledge and awareness about CSU organization and activities and created some synergies with past and new WUC partners. The General Assembly of Partners (GAP) is an important result of the Habitat III preparatory process and should be established as a legacy of Habitat III to enable wide stakeholders participation in the implementation process of the New Urban Agenda and the urban dimension of the SDGs. GAP will not only provide a vital link between government and cities in terms of implementation of urban policy but could also serve as a template for multi-stakeholder cooperation across the entire UN system. GAP held its Sixth Plenary Meeting on May 7, 2017 in Nairobi, Kenya, where it approved its revised Constitution and discussed the Partner Constituent Groups Strategic Frameworks and Action Plans towards the implementation of the New Urban Agenda. It sponsors workshops and a Seventh Extraordinary Plenary Meeting on May 11. CSU is a member of the Professionals Partner Constituent Group of GAP. CSU had the opportunity to deliver its statement on the 2nd day of the Governing Council during the High-Level Segment. CSU Statement has been uploaded in the Governing Council website and is available here. The dates for the 27th session of the Governing Council of UN-Habitat are 8-12 April 2019, and the ninth session of the World Urban Forum will take place from 7-13 February 2018 in Kuala Lumpur, Malaysia; and the tenth session of the World Urban Forum will take place in Abu Dhabi in 2020. Most of the Member States underlined the need for a better coordination between UN agencies to implement the New Urban Agenda and recognized the role of UN-Habitat as focal point in this process.